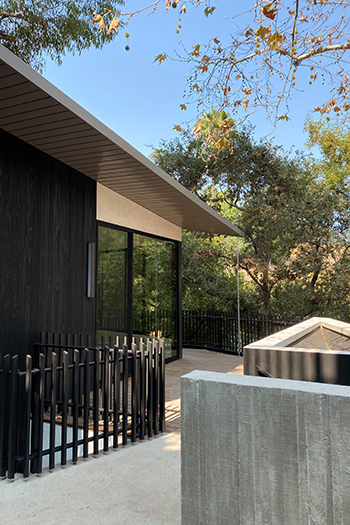 Situated behind an existing hillside residence, this writer’s cottage and photographer’s studio project considers both geologic and biologic metaphors for architecture. The clients envisioned a woodsy, quiet retreat for concentration and reflection that would also produce a thoughtful, formal architectural solution. A variety of mature, protected trees on the steep, down-sloping hillside influenced the project's design: negotiating the irregular clearing spatially while paying attention to the trees' different structures and textures to direct the project's materiality. Wood and metal wall, railing and roof claddings mapped to the building respond to these fine-grained conditions on site. Both bigger and smaller than it actually is, this study in reconciling geometry, texture, experience and view embraces a purposeful misregistration of these factors, yielding a compact building of varied spaces rich with expanded possibilities.